Clear Light Healing - Spiritual Light heals all sickness, dissolves all sorrow, banishes all fear, and melts away all anger. Open yourself to the Light, and experience the magic and power of dynamic healing in your life. Spiritual Light heals all sickness, dissolves all sorrow, banishes all fear, and melts away all anger. Open yourself to the Light, and experience the magic and power of dynamic healing in your life. Welcome to my Clear Light website! I hope your interest in Clear Light brings you renewed health and happiness. In my ongoing quest to bring more love and light into the world, I have written a spiritual novel that I hope will entertain and enlighten people at the same time. Path of the Initiate, the first book in the series Atlantis to America, will be published as an ebook, a print book and an audio book in March 2018. As this is a very busy time for me, I am leaving all but remote healings to our very capable group of Clear Light healers. On the CLH Practitioners page, you will find a list of my personal students, all of whom have been Clear Light healers and teachers for many years. Additional Clear Light healers and teachers can be found through Google. If you would like a remote healing, I will be available on a limited basis. Please feel free to call me and we can set up an appointment. As we get closer to my book release date, I will provide a link to my writer's website where you can learn more about my literary work. Treat yourself to new consciousness! If you are reading this, you have already done lots of work on yourself and are ready to take the next step in your healing process! Through Clear Light Healing, you can release negative thoughts and emotions, and increase the quality of your Light and your life. You can enjoy a pain free, joy filled existence once your physical, emotional, and mental systems are cleared of old patterns. Clear Light Healings will introduce you to new thoughts and feelings that will accelerate your spiritual growth and bring more love, health, and prosperity into your life. What is a Clear Light healing? In addition to pain relief and re-energizing and balancing your system, I am able to intuit information regarding your emotional nature, interpersonal relationships, and life situations. This objective perspective, along with appropriate, curative affirmations, will give you the tools to participate in transforming yourself and your life. You will feel a deep sense of peacefulness and calm during and after the healing. Longer ranging effects will unfold over the following few days, bringing an increase in mental clarity, emotional stability and physical strength. Who benefits from Clear Light Healing? Clear Light heals you by addressing all four levels of experience. In order to become completely whole, you need to address the underlying emotional, mental, and spiritual issues that have caused your illness in the first place. Until you understand and release the root cause of your problems, you will continue to attract more illness or accidents. 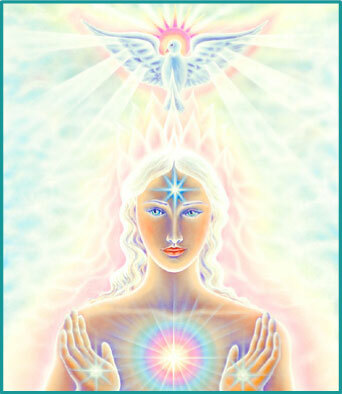 By integrating all four levels of experience, Clear Light healings will balance and cure the deepest part of you.